Human brain is the most complex and vital organ. It has countless functions. Each function of human body is influenced by the functioning of brain. 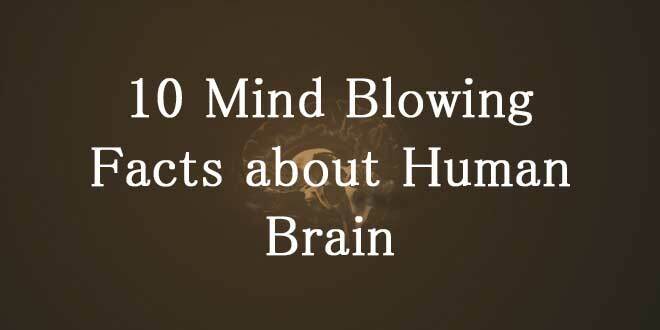 Today you will learn 10 mind blowing facts about human brain. In each neuron, nerve impulses’ speed varies rapidly. The fastest speed is faster than the most famous racing car called Formula 1. It is 250 mph. the speed of neurons with myelin and without myelin varies a lot. Faster are those, which are with myelin. Human brain is one of the heaviest human organs. It is almost 1400 grams. But the most amazing fact about its weight is that we never feel any burden of our brain on our head. The reason behind this mind blowing fact is that the weight of brain is apparently reduced because it is suspended in Cerebrospinal fluid. This suspension creates buoyant force on our brain and ultimately its weight is less felt up to 1 kg. Ectoderm, the germ layer is the part from where the brain arises. It plays role in growing hair, nails tooth enamel and sensory epithelium of nose, eye, ears and skin. Hippocampus is that part of the brain, which has the shape quite similar to sea horse. This is why it has been given this name. This part is found in the inner of the brain and it plays role in development and control of limbic system. This system is responsible in the production of emotions. It is said that so far only 2% of the human brain is used. Though it is still a myth. The fact is that a human being cannot calculate how much he is using his brain. Out of the total body weight, the brain is only 2% of it. But the amount of blood it gets from heart weighs 20%. More than 100 billion neurons combine together to make a brain functional. They are can generate energy to power a light bulb of small size. The kind of power this organ has, it just needs quite less energy requirements. There is so much to be learnt about this amazing organ that Albert Einstein’s brain was stolen by a coroner. Brian is divided into two parts including left and right hemispheres. The left hemisphere favors ration and analytical thinking. Whereas, right hemisphere favors visual and conceptual thinking.